My son Harry has two diagnoses. His primary diagnosis is of Goldenhar Syndrome, a rare congenital craniofacial condition which affected the formation of his facial features. The second diagnosis is of Autism including Global Learning Delay. 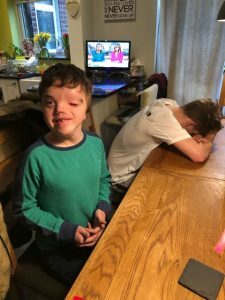 It is Harry’s autism that has the biggest impact on his cognition, self-awareness, self-regulation and communication but one of the aspects of life that affects both him and the wider family the most is the relationship between autism and sleep. 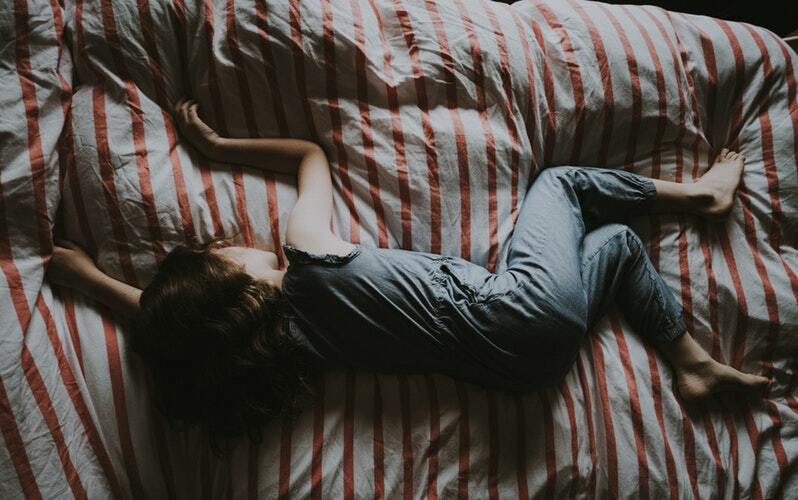 Spectrum News reports that between 44 and 86 percent of children with autism have a serious problem with sleep whereas between 10 and 16 percent of children in the general population have difficulty sleeping. They suggest that this lack of sleep may worsen certain features of their condition, such as repetitive behaviors, which can, in turn, make sleeping even more difficult. Its no surprise that, given this disruptive feedback loop, sleep problems are among the most urgent concerns for families like ours. So what causes the issues with sleep in those with autism? Well, to be honest, little is known about the actual reasons and whether the causes are hormonal, physiological or social. Many people with autism have additional conditions such as ADHD, Anxiety and other medical issues which may play their part in disrupting sleep cycles. As it’s impossible to study the impact of these aspects in isolation it’s very difficult to know the extent of their role. What is clear, is that prolonged sleep disturbances have serious and detrimental consequences. Siblings can struggle to concentrate at school and many studies have shown that long term sleep deprivation or lack of routine, affects parents and carers focus, energy levels and mental health. For me, my sleep disturbance started even before my boys were born. From around 5 months pregnant I was making nocturnal trips to the loo approximately 5 -7 times. You would think this would have prepared me for what was to come as a parent. It didn’t. Due to Harry’s craniofacial condition, his Dad and I had to check on him every 20 minutes or so, 24 hours a day. We took it in shifts but it was exhausting. As Harry grew older it was clear that the methods that worked in soothing Oliver off to sleep had little or no effect on him. His diagnosis of Autism was a relief in some ways as it helped to explain his lack of communication and sleep. My boys are almost 14 years old now and, although Harry has had short phases of sleeping for a block of hours, these are shortlived and we are currently experiencing a return to the 1.30am starts to the day. 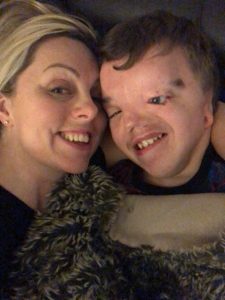 I share our struggles with the incredible online community over on facebook but I have never explained the various strategies we have used over the years to try to help Harry, and help ourselves! Melatonin is a natural hormone that controls sleep but the levels are believed to be different for those with autism and those who are neurotypical. Harry was prescribed melatonin as a young child but it made him more hyperactive and so we decided not to use it again. We did try a few years later but prolonged use of it made Harry docile and less responsive, a dulled version of himself and I couldn’t bear it so again, we stopped. Now, Harry will have melatonin only on occasions. Just for information – there are two types of prescription. Fast acting for those who struggle to actually get to sleep but can remain asleep and slow release for those who wake in the night. Unfortunately, the slow release we were prescribed were in tablet form which, once chewed, became fast acting and so while Harry fell asleep quickly, he was also awake pretty soon too. In summary, melatonin didn’t work. 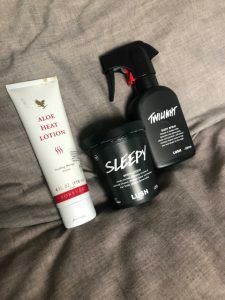 I have tried vapour rub or heat lotion on the soles of Harrys feet as well as a relaxing lavender cream (which had rave reviews) on Harry’s chest and the same scent on his pillow (not at the same time). Again, I would have a couple of nights of sleep where I felt that we had found a solution only to have Harry wake again anything from 2 am and the chaos would begin again. Weighted blankets are pretty much as they sound. Blankets covered in small pockets which have individual weighted packages in them, calculated in proportion to the child’s body weight (approximately 10% + 1 or 2 pounds). Since it is known that deep touch pressure helps to release serotonin, a neurotransmitter that helps to regulate some brain functions, weighted blankets are used to help with sensory regulation. 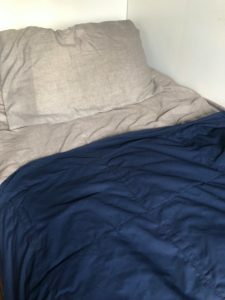 Harry responded well at first to the use of his weighted blanket but after a couple of weeks, it was redundant, making no difference to his early starts. A well-meaning relative suggested this one and we tried it a couple of times but what those nights taught us was that a later evening made no difference to Harrys wake time but just meant that we were more exhausted. Again, another no go option. Over the last couple of years, we have ensured that Harry’s technology is turned off 40 minutes or so before bed. Lights are dimmed and cuddles commence. Harry will snuggle into my arms and relax, the telling sign being the change in his snuffle to more gentle and rhythmic. I will stroke his hair and then whisper that it’s time for bed. At that point, he will either stumble up the stairs and drop into bed or bounce up from the sofa in a fit of giggles, bounce and squeal his way to bed. There is little way of predicting his reaction and a calm bedtime routine never guarantees a good nights sleep but if nothing else, it’s a lovely time for us both. Although Harry can’t tell the time there are a few night light/clocks which visually count down the hours until a pre-set ‘wake up’ time. I bought one with the very best reviews but with Harry’s limited understanding, he didn’t grasp the concept of waiting and it made no difference to his sleep. At the moment, Harry absolutely loves his starlight projector which rotates a variety of stars and colours across his bedroom ceiling. 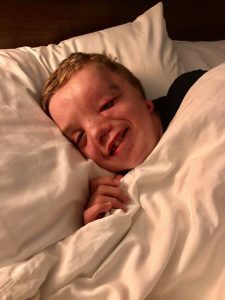 It is placed on a timer for 45 minutes from when he goes to bed at 9 pm and it seems to settle him well although it doesn’t help him to stay asleep. On their own, blackout blinds make little difference but when used with the other ideas, there were nights when Harry slept for longer periods of time than others. There really is no way of knowing what makes the difference on the odd nights that he does sleep. This one is always traumatic, relentless and exhausting. My record is 19 returns to his own bed in one night and the night time activity is one of the reasons why I reduced my teaching hours to part-time. As Harry has grown older, bigger and stronger, the struggles to return him to his own bed, when he is determined to sleep next to me, are becoming more of a challenge. If I am unable to return him to his bed, I direct him downstairs and will lie on the other sofa or lie back in bed with the doors, and one ear open. Sadly, training myself in the ways of superhuman hearing means that even when Harry isn’t here, I will jolt awake, convinced that I have heard him. There is a huge difference between a tired mind which needs to sleep and a sleep-deprived mind which exists in a permanent state of awareness, arousal, and exhaustion. Sleep deprived is NOT the same as tired. Sleep deprivation is excruciating torture. As you can see, I have tried many things (some I will have forgotten) over the years, all with varying degrees of success. There will, of course, be many things I haven’t tried yet but I am pretty sure based on Harry’s past record where sleep is concerned, that I’ve got plenty of time. If you have any suggestions, fire away. I am all ears! Have you tried Phenergan? Available over the counter or online (subject to questionnaire). 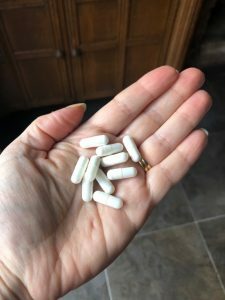 It’s basically a type of antihistamine, but is recommended for use to help with sleep difficulties and/or travel sickness, aswell as allergies. It’s available in 2 strengths of tablets, or a liquid elixir for very young children. I don’t know if it’s something that would be suitable for Harry but just a thought. I used it during a very stressful few months to aid my sleep (I’m a dreadful sleeper at the best of times). I found it worked wonders, and I could sleep for up to 10 hours straight, but wake up fresh, not feeling ‘drugged’, as some other products I’ve tried have done. I so understand this. We have also tried all of the above with similar results. Melatonin was an awful experience for us and made things worse. The only thing currently helping us a little is the high dose of epilepsy meds that Isaac is now on which make him drowsy. As he adjusts to that though we are back to the beginning again. Summer holidays are the worse as I can not catch up during the day time.